Shadow the Hedgehog is a prominent anti-hero and the rival of Sonic the Hedgehog in the Sonic the Hedgehog series. He was created to be the "ultimate life-form" by Dr. Eggman's grandfather, Gerald Robotnik. Shadow does whatever is necessary to achieve his goals, and because of this he has fought both alongside and against Sonic the Hedgehog. 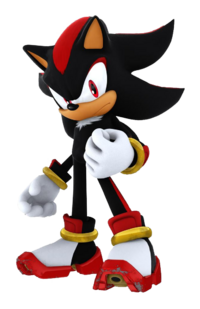 While Shadow typically shares most of Sonic's abilities, Shadow primarily uses a variety of "Chaos" powers to battle enemies, most notably Chaos Control, a power that allows him to distort time and space. Shadow the Hedgehog crosses over with the Mario franchise in the Mario & Sonic and Super Smash Bros. series of games. He was voiced by Jason Griffith, along with Sonic the Hedgehog and Jet the Hawk, in his first three Mario crossover appearances, and is currently voiced by Kirk Thornton since Mario & Sonic at the London 2012 Olympic Games. Shadow is a playable character on Sonic's team in Mario & Sonic at the Olympic Games. His character type is Speed, equaling him with Sonic, but he has higher stats than Sonic in other events. In Dream Fencing, his special move is transforming into Super Shadow and charge forward with multiple stabs of his épée. He also turns into Super Shadow in Dream Table Tennis and jumps up, twirls vertically, lands, inhale, and then fire the ball super fast at the opponent. Shadow has the lowest level stamina among all the characters. Shadow also appeared in the sequel, Mario & Sonic at the Olympic Winter Games. He appeared as a speed character, like in the predecessor. However, unlike with the previous game, Shadow is slightly slower than Sonic, but he has the strongest acceleration abilities in the game. Shadow makes another playable appearance in the third installment of the Mario & Sonic series: Mario & Sonic at the London 2012 Olympic Games. Like the previous installments, Shadow is a Speed type character, alongside Yoshi, Princess Daisy, Sonic the Hedgehog, and Metal Sonic. Shadow is playable again in the fourth game of the Mario & Sonic series: Mario & Sonic at the Sochi 2014 Olympic Winter Games. Like previous games in the series, he is classified as a Speed type. Shadow is a default playable character in Mario & Sonic at the Rio 2016 Olympic Games. In the Nintendo 3DS version, he is only available to play with in the Football and 100m Dash events. He is available in all events in the Wii U version. If the player's Mii avatar interacts with Shadow, the latter will get irritated at the avatar mixing him up with Sonic and demand he not put him on the same boat as him, referring to Sonic as an "inferior half-wit." Shadow appears as an Assist Trophy character in Super Smash Bros. Brawl, Super Smash Bros. for Nintendo 3DS / Wii U, and Super Smash Bros. Ultimate. In Super Smash Bros. Brawl, Shadow is an unlockable Assist Trophy, unlocked after the player unlocks Sonic, though in the later installments, as with every other Assist Trophy, he is available from the start. Shadow uses Chaos Control to temporarily slow down time around opponents (having the same effect as the Timer). In Super Smash Bros. Ultimate, Shadow is seen holding up a Chaos Emerald, and before the move ends, all opponents freeze for a short period of time. In Super Smash Bros. for Nintendo 3DS / Wii U, like several other characters, Shadow is voiced by a different voice actor in different regions (e.g. he has his French voice in France). Like Sonic the Hedgehog, Shadow is an extremely fast hedgehog that can give his more famous blue rival a run for his money in most Speed events. Additionally, his accuracy will help give him a leg up in the events like the archery and fencing. GCN SHADOW THE HEDGEHOG Shadow The Hedgehog is a black hedgehog who resembles Sonic. He was created by Dr. Eggman's grandfather, Gerald Robotnik, to be the ultimate life-form. Not only does he look like Sonic, but he has equal abilities. He has great skill with the space-time warping technique called Chaos Control. To reach his goals, he'll use any means necessary. GCN Shadow the Hedgehog (11/2005) Engineered to be the ultimate life-form by the brilliant Professor Gerald Robotnik, this black hedgehog appears very much like Sonic. He has a dark side, however. In Smash Bros., he uses Chaos Control to warp space-time, slowing every fighter down except the player who summoned him. A black hedgehog created by Professor Gerald Robotnik to be the Ultimate Lifeform. Though he looks a lot like Sonic, he's ruthless and will do anything to achieve his goals. In this game, he uses Chaos Control to warp time and space, slowing down everything around whoever summoned him. Shadow the Hedgehog, in his black fur and red stripes, returns to test his skills in the Olympic Winter Games. With the ability to harness the power of the Chaos Emerald, Shadow can perform Chaos Boost on the Wii and DS, and Chaos Control on the DS. Shadow the Hedgehog Name in Spain. In some of Latin America's countries. Yozh Shedou Ёж means Hedgehog, and Шедоу is a cyrillization of Shadow. This page was last edited on April 18, 2019, at 10:07.